News media agencies have been doing a little self-criticism lately but it's a criticism that tends to look backward, about as far as the runup to the war in Iraq. Now comes a historian, Arthur Schlesinger, Jr., who sharply attacks what he calls the "supine press" for its coverage since then. The liberal Schlesinger isn't just any historian. He has been attentive to the press for generations and has had a close family association with the Nieman Foundation, sponsors of this Web site. So his attack, it seems to us, is one that comes from an astute friend of the news media. It is nevertheless very sharp. Schlesinger made his comments in an essay titled "The Making of a Mess" that is part book review, part political analysis in the Sept. 23rd, 2004, issue of the New York Review of Books. He said the press kowtows to the Bush administration. The Times 's downplay of criticism of the Bush administration continues. On August 4, the Times buried in its National Briefing column an item about a "group," unnamed and unidentified but said to include twelve former presidents of the American Bar Association and several former judges. The group had criticized Bush administration lawyers for memoranda in favor of permitting torture of prisoners in certain circumstances. Bush's lawyers, the statement said, had failed to meet their professional obligations by counseling individuals to ignore the law and offering arguments to minimize their exposure to punishment for doing so. This would seem a major story, but the Times was too busy giving prominent play to the so-called Swift Boat Veterans for Truth and their attack on John Kerry's military record in Vietnam. As for the Washington Post, Schlesinger wrote, "When Dana Priest, The Washington Post's national security reporter, addressed an audience of intelligence officers recently, [by her own account] she was peppered with questions. 'Why didn't the Post do a more aggressive job? Why didn't the Post ask more questions? Why didn't the Post dig harder?'" It never occurred to the deferential American press to ask about torture before the Abu Ghraib disclosures, to inquire into the behind-the-scenes arguments about how far to go in interrogation, to inquire much about the treatment of prisoners in Guantánamo. This was a big issue in Britain, where there is now a London play about the Guantánamo prisoners, which opened in New York as well on August 26. 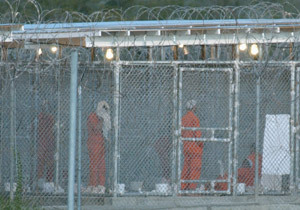 Guantánamo itself was played down in the American press. The actress Vanessa Redgrave organized a committee of families of British detainees and led a delegation to Washington in March 2004. Their press conference was ignored by American newspapers and television. The situation is as follows: In 1994 Congress passed the Spratt-Purse amendment stipulating that "it shall be the policy of the United States not to conduct research and development which could lead to the production by the United States of a new low-yield nuclear weapon." Low-yield nuclear weapons, fondly known as mini-nukes, are defined as under five kilotons. The Bush administration, fearful that evil states might hide WMDs in hardened bunkers buried deep in the ground, called for a low-yield nuclear weapon known in the patois of the Pentagon as a Robust Nuclear Earth penetrator, a description often abbreviated into Bunker Buster. Mini-nukes of course can be used additionally as tactical weapons for the battlefield. In May 2003, the Senate Armed Services Committee voted for repeal of the prohibition on mini-nuke research. Senators Dianne Feinstein of California and Ted Kennedy then submitted an amendment restoring the original language of the Spratt-Purse amendment. Supporters of the Feinstein-Kennedy amendment pointed out that mini-nukes were not toys, that five kilotons represented one third of the explosive power of the bomb that destroyed Hiroshima, that the activation of mini-nuke research would run counter to US anti-proliferation policy and would "release a chain of reactions across the world in nuclear testing" (Kennedy), and that there was "no such thing as a usable nuclear weapon" (Feinstein). Nevertheless the Senate tabled the Feinstein-Kennedy amendment. The fight was resumed on June 3 and 15, 2004. Kennedy made a powerful statement: "America should not launch a new nuclear arms race.... Even as we try to persuade North Korea to pull back from the brink — even as we try to persuade Iran to end its nuclear weapons program, even as we urge the nations of the former Soviet Union to secure their nuclear materials and arsenals from terrorists — the Bush administration now wants to escalate the nuclear threat." The director of the International Atomic Energy Agency, speaking before the Council on Foreign Relations, compared the US to "some who have continued to dangle a cigarette from their mouth and tell everybody else not to smoke." The Senate defeated the Feinstein-Kennedy initiative by a vote of fifty-five to forty. How many readers of The New York Review of Books recall editorials condemning the Senate's action or news stories about the vote? Yet reopening the nuclear door at a time when preventive war became part of US doctrine may have the gravest possible consequences for the human race. According to Murrey Marder, the guardian angel of the Nieman Watchdog Project and a history buff himself, Schlesinger's father, Arthur Sr., was close to being a godfather to the Nieman program at Harvard, along with John Kenneth Galbraith. "Arthur Jr. and the Niemans virtually grew up together intellectually speaking, giving him an unusual relationship with the American press," says Marder. 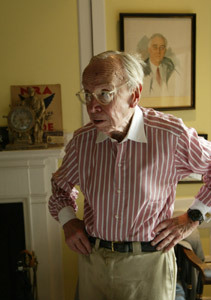 Schlesinger Jr. was a presidential special assistant and in-house historian for John F. Kennedy, and his book 'A Thousand Days' won a National Book Award in 1965 and a Pulitzer prize for biography in 1966. "More significant about why his broadside at the press has exceptional resonance," Marder says, "is that soon after he became in-house historian of the JFK administration, Arthur wrote an article that rebounded in the national and international press like a hand grenade. He said he wanted to apologize for what he relied upon from press sources as a historian before entering the White House because as an insider he quickly discovered that press accounts of ongoing events were remote from reality. "The zinger," Marder says, was that "at the end of the JFK years, Arthur publicly did a 180-degree reversal. He wrote that he ultimately learned from his privileged insider perch that the most top-rated information inside the government was often the most misleading and, based on deeper experience, what was reported in the press was often far more accurate." That was then; this is now. In his New York Review piece, Schlesinger did note some good work done by the Times and Post. But for the most part, he was highly critical. In one instance he described what has been an almost media-wide disregard for a distinguished group of high-ranking, retired diplomats and military leaders who came out in June to proclaim the Bush administration a disaster for the U.S. and the world. Members of this group, Diplomats and Military Commanders for Change, include Admiral William Crowe, former chairman of the Joint Chiefs of Staff and ambassador to London; General Merrill A. (Tony) McPeak, Air Force chief of staff under the first President Bush; Arthur Hartman and Jack Matlock, former ambassadors to the Soviet Union; Donald McHenry, former ambassador to the United Nations; Stansfield Turner, former CIA director under Jimmy Carter; and other experienced and distinguished figures. On June 16th, 2004, the group held a press conference in Washington. They referred to the Bush administration as one that is "blinded by ideology and a callous indifference to the realities of the world around it." In a statement, the group noted that its members had "served every president since Harry S. Truman. Some of us are Democrats, some are Republicans or Independents, many voted for George W. Bush. But we all believe that current Administration policies have failed in the primary responsibilities of preserving national security and providing world leadership. Serious issues are at stake. We need a change." The group got some slight, mostly one-day coverage for what could well have been a running story. Our own quick Google research a couple of weeks after the press conference suggested that the news organization that paid the most attention — are you ready for this? — was Bloomberg! Schlesinger, focusing on the Times, says "the statement by professionals criticizing the government in wartime seems unprecedented in American history and ought to be taken with the utmost seriousness. But the Times, the fabled newspaper of record, ignored the press conference, did not run the statement or quote from it, and did not print the list of signatories."